This page is a collection of Microsoft Teams and Skype for Business related questions and answers. It’s regularly updated as more information becomes available. Q: What is Microsoft Teams? A: Microsoft Teams is a complete communications platform, that takes the best bits of Skype for Business, Yammer, SharePoint, Email and other web sources and presents them in one easy to use application. You can send IM’s, make voice and video calls, phone calls, Share documents, and collaborate all from within the one application. Q: How do I get Microsoft Teams? A: Simple! Sign up for an Office 365 plan over at http://www.office.com. If you’re already an Office 365 subscriber, check to see if Teams is available – it more than likely is! Q: We currently use Skype for Business and Yammer. Should we make the switch to Teams? A: Yes, but gradually. At some point in the future, Microsoft Teams will completely replace Skype for Business online from Office 365 (on premise versions of Skype are safe for now). It’s wise to start evaluating Teams now so that you can familiarize and prepare yourself once your organisation moves across. You can also check out this short video on the subject of Yammer and Teams. Q: We currently use Slack, and our devs aren’t going to want to give up slack easily. A: Sure, change is scary. However, the ability to collaborate so simply in multiple ways within Teams makes it the ideal platform for dev teams to effectively work on. Give it a go! Q: What about the investments we have made in Skype for Business hardware (phones, meeting room devices) and licensing? 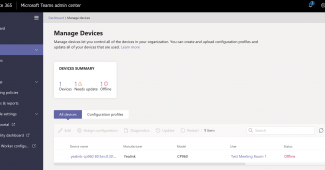 A: Vendors are working hard to ensure their devices are compatible with Microsoft Teams. Right now, if the device is a year or two old and works with Skype for Business, there’s a good chance that with a firmware update from the manufacturer, it’ll work with Teams too. Q: Are we able to develop custom applications for Teams? A: Sure. You could write a custom application! Q: Teams to Standard SIP video InterOP, will there be a open API available to develop one? or should we depend on the Teams Partnered service providers only? A: My understanding is that right now there’s only Teams/Skype integration. Whether that will change is a great question. Keep your eyes peeled on the Office 365 Roadmap. Q: Will Teams support open Federation with other (on-premise or 3rd-party hosted) Skype for Business deployments? A: Federated communication between other teams and Skype for business environments is on the Office 365 road map (https://products.office.com/en-us/business/office-365-roadmap?filters=#abc) and is currently in development. Q: Should I be able to copy and paste Screenshots into the Wiki Feature? They keep disappearing. A: From my testing, I am able to copy and paste screenshots that I took with the snipping tool in Windows into Wiki pages, and they remain in place. Q: Am I able to invite people from other organisations into Teams chats, file sharing and other things? A: Yes! Microsoft recently announced that guest access in Microsoft Teams is now fully rolled out, meaning you can now invite anyone into a Microsoft Teams team to chat, share files and more! Q: Are there any limitations with On premise Skype for Business users, and Microsoft Teams users in the cloud? A: Yes. The two won’t be able to communicate with each other. To solve this issue, move your on premise SfB users to Office 365. Q: We want to adopt Teams in our environment but are unsure how to proceed. Help! Q: Are there any handsets available for Microsoft Teams? A: There certainly are! Right now (as of February 2019) there are two manufactures producing handsets – Yealink and AudioCodes. Teams to Standard SIP video InterOP, will there be a open API available to develop one? My understanding is that right now there’s only Teams/Skype integration. Whether that will change is a great question. Keep your eyes peeled on the Office 365 Roadmap. Re SIP video interop, I don’t think that will happen for a long while (or maybe ever). Microsoft have 3 vendors on developing solutions, BlueJean, Pexip and Polycom. 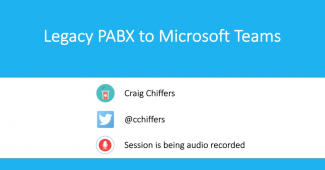 Polycom and Pexip have native Skype integration so will be native for Teams too, BJN will just have Teams interop, they SfB workflow takes you out of the SfB experience. Graham, absolutely. Unless a vendor comes along and there’s a strong demand for Inter-op, I doubt it would exist. Either way, who knows! Will Teams support open Federation with other (on-premise or 3rd-party hosted) Skype for Business deployments? Federated communication between other teams and Skype for business environments is on the Office 365 roadmap (https://products.office.com/en-us/business/office-365-roadmap?filters=#abc) and is currently in development. Is the Wiki feature still Beta? If I create a Wiki document and paste screenshots, initially it looks good, screenshot stays, however if I click outside of Wiki then come back, the picture is gone and the only think left is a gray rectangle, same shape as the original screenshot. I don’t think I should follow a different procedure than to copy/paste (intuitive) that’s what I think this may be a bug or Wiki in Beta mode. Thoughts? From my testing, I am able to copy and paste screenshots that I took with the snipping tool in Windows into Wiki pages, and they remain in place.